Sweetwater Camp is a campsite south of the Imperial City containing bandits. 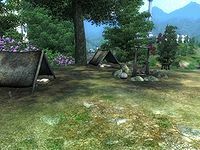 Located right between the Ayleid ruin of Sardavar Leed, the place where Queen Alessia grew up in slavery, and Fort Alessia, Sweetwater Camp is an fairly unremarkable camp, although the ruin's Ayleid Well makes it fairly convenient for travelers. It consists of two tents with bedrolls, an unlit campfire, and two sacks - one with food, the other containing minor loot. On a clear day, both the ruin and the fort can be admired, while the northern view offers an overlook over the Red Ring Ring Road, Lake Rumare and, across the water, the entire Imperial City. A path from the Red Ring Road leads directly to the camp and its Bandit inhabitants. South of the camp, on the rock formation up the hill, grow two Summer Bolete, and a Green Stain Cup. This page was last modified on 3 June 2017, at 18:40.